Things keep getting worse for the New York Knicks, redefining pathetic with every game and loss that automatically comes. Carmelo Anthony is pretty much done for the season unless something surprising happens, and the Milwaukee Bucks beating them in their latest embarrassment in front of home fans served as another wake up call to those who thought this season might be about anything than tanking. 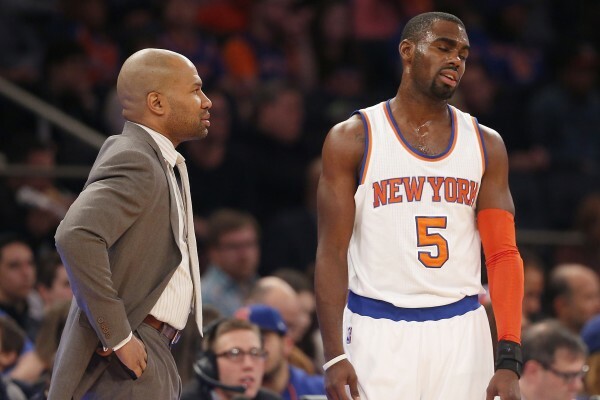 The Knicks have lost 11 straight games, and 21 of their last 22 games. They’ve also had losing streaks of 10 and 7 earlier in the season. They are 3-15 at home, have scored over 100 points just twice in their current losing streak and are playing with Carmelo Anthony, who is suffering from soreness in his knee which might lead to him being put on the shelf for the season while Amare Stoudemire is hurting as well along with Samuel Dalembert and Andrea Bargnani. In short – a team’s entire cap space is out of commission. It’s not that they’ve been playing a lot better with them, but Derek Fisher has very little to work with. Right from the start it wasn’t going to be an easy job, but the delusion levels ran high in New York when Phil Jackson became the team president, or when Anthony was signed to the max extension. This isn’t a playoff team, not anymore, and it just might be in a race with the 76ers to finish as low as possible in the Eastern conference this season. The words of Amare Stoudemire after the loss to the Bucks, coming from the view point of someone who was brought to turn things around and actually did it quite well for a short while back in 2010 and is now not even playing, knowing that once his contract is up the demand for his services around the league aren’t exactly going to skyrocket, paint a very accurate picture of just how clueless the players seem to be about how bad they were in the first place. It’s beyond my imagination at this point. I never thought I’d see this. This is definitely kind of mind-boggling. It’s a tragic thing. When I first signed with New York, that wasn’t the game plan. But the past is not here. And neither is the future, so we’ve got to deal with the now, and I think we’ve just got to continue to try to get better as a team and as players, try to keep improving. It will turn for us. It just doesn’t look like it right now. Players don’t tank, front offices do, most of the time the head coaches play along. But the Knicks, in the small maneuvering room they had to work with this offseason because of all the huge contracts, didn’t act like a team looking to tank and throw the season. They genuine believed that implementing the triangle and once again relying on the scoring of Carmelo Anthony was going to put them on track for the playoffs. Last season wasn’t a glitch. It was the beginning of the end; the end of the road for most of these players on this team.